A colleague’s henna tattoo for her brother’s wedding. It has almost the same intricate design on the front. This is my entry for this week’s photohunt. .-= mordsith´s last blog ..rise and shine…and sleep again =-. .-= fortuitous faery´s last blog ..Vancouver 2010 Winter Olympics Postcard =-. Very nice 🙂 How much does it cost to have henna done in UAE these days? .-= SleeplessInKL´s last blog ..Vanilla Beans For Sharing =-. parang kandila yung kamay na may design. Ganda. Wedding tradition ba yan dyan? .-= redlan´s last blog ..THE DIFFERENCE BETWEEN LOOK UP AND LOOK DOWN =-. Natawa naman ako dun sa comment about the Prison Break. Oo nga naman. 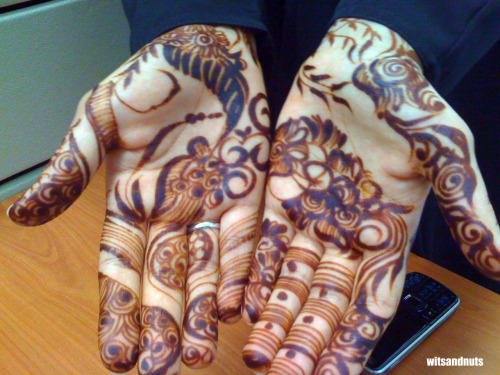 I like the designs of henna tattoos during weddings. Nakakabilib ung mga twirls and loops and choices of colors nila. Artsy! .-= Nebz´s last blog ..Remittance made-easy for OFWs in Khobar =-. cool.. intricate yet not that superfluous..
.-= The Last Jedi´s last blog ..For One More Day =-. really cool. i keep thinking if they painted that on the face…lol. .-= kayni´s last blog ..Turning Thirty-Two =-. i remember my college classmate who had her hands like that too. .-= upto6only´s last blog ..PHOTOHUNT: Spotted Wings =-. .-= jams o donnell´s last blog ..Bebe and the not-wife’s foot =-. i’m not into body art and piercing but i know how to appreciate them. this one is really nice; fascinating actually. .-= docgelo´s last blog ..LEVEL UP! =-. Wow that is intricately well done. Thanks for sharing! .-= Kim´s last blog ..Lonely Bunny =-. .-= colleen´s last blog ..Photohunt: Spotted =-. .-= sandy´s last blog ..Spotted =-. .-= Lisa´s last blog ..PhotoHunt: Spotted =-. beautiful intricate work. I spotted the cell phone underneath. Kind of a contrast too me. Certainly another interesting theme with lots of different takes. I’m glad I came and saw yours. Wow. That looks like a lot of work to create! .-= Susanne´s last blog ..Photo Hunters – Spotted =-. I like the artistic part, but putting it on hands, kinda weird me out. .-= BlogusVox´s last blog ..Pangaral Ng Isang Cool Na Magulang =-. .-= YTSL´s last blog ..Spotted (This week’s Photo Hunt theme) =-. great photo, wits! I still have to do this. the last time i had the opportunity for free henna tattoo, i was pregnant and it was no, no hihi. hopefully in the coming eid..tagal pah! .-= Kero´s last blog ..International Aerobatics Show 2010 =-. I am always fascinated by the henna designs. I wish to have mine done too, I don’t know what’s the protocol about this but, it’s so cool, don’t you think. I was unable to open the pix last Friday, hence I am only commenting now. Better late than tardy! .-= Photo Cache´s last blog ..La Boqueria – A Foodie Mecca =-. wow ang ganda. Intricate ng design. Gaano katagal yun ginawa? .-= renin´s last blog ..At the bus stop =-.